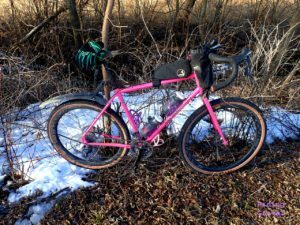 The WTB Venture tires have finally gotten a few rides worth of testing lately, enough to add to our last update from Grannygear. In this update we will get a look at how the Venture handles a variety of surfaces and conditions which are completely different from our SoCal look. Transition season in the Mid-West means a little bit of everything. While Grannygear was slipping in rides between rain storms in SoCal I was patiently awaiting the beginnings of Spring in the Mid-West. 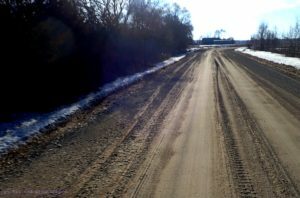 Days over 25°F, melting snow, and ice covered roads give way to 50’s, Sun, and “hero dirt” in a span of about three weeks time. This is what we call “transition season”. You can have Winter half of one day and spring the next half. Challenging conditions for both rider and tires. 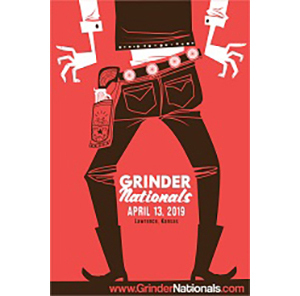 I was reticent to go out early in transition season here, but a friend of mine convinced me that a casual recon for an upcoming recreational ride he was planning would be mostly pavement, that is, until it wasn’t. But that’s what adventures are made of- the unexpected. The Venture provided me with a capable shoe which was more versatile than I had suspected it might be. The ride was mostly on paved roads where I was able to motor along well enough that I didn’t feel handicapped by the thousands of tiny tread blocks the Venture has. This even though I was running around 30psi rear and in the high 20’s on the front in case we had any ice to deal with. In fact, we did ride some crusty ice and snow which had refrozen into a consistency of styrofoam. Old drifts were so hard we could ride over most of them, the Ventures sinking in somewhat, but the 47mm width allowed me to claw through well enough that I made it through much more than I thought I could. Then the icy bits were touch and go, but I had enough of a “platform” that I was able to keep the rubber side down. The roads are straightening up, but not before we go through the soft, muddy transitional season. Then we transitioned to soft roads and muddy spots here and there. 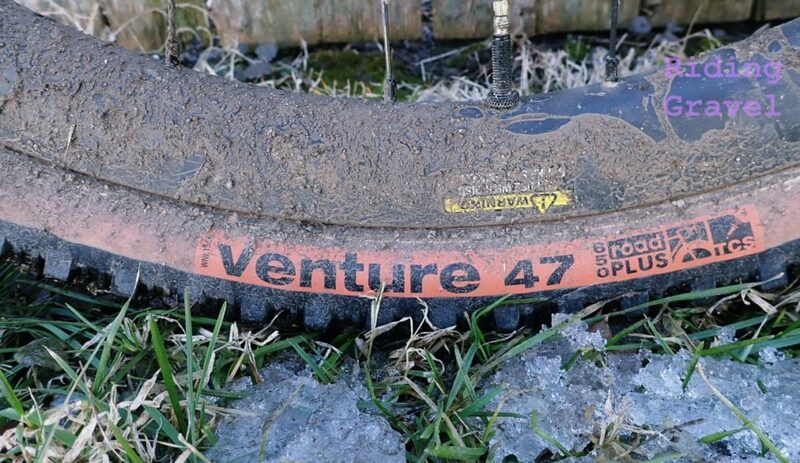 The Venture again proved to be a capable tire in these conditions. 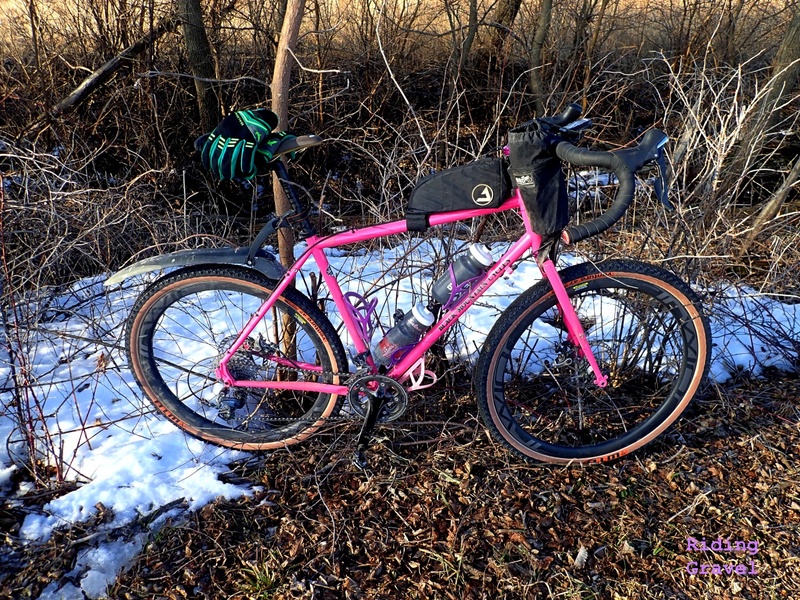 I noted on a different ride that using a WTB Riddler 37mm tire was taxing in these conditions, as that tire tended to cut into the mud, increasing the rolling resistance exponentially. The Venture, ridden the following day over the same terrain, floated more and was much easier to ride. One thing I noted was that despite the deep, small, almost “siped” type tread that the Venture sports, it did not carry mud, or pack up much. This was a bit of a surprise for me, as I was expecting it not to do well in mud, but so far, it hasn’t been a big deal. I did notice that it does turn well, as did Grannygear. I’m not feeling the Venture is as fast as a Horizon, but it shouldn’t be either. That said, I think it does just fine on tarmac and cement roads. The more broken up the better. That’s where 650B “Road Plus” shines, in my opinion, unless we’re talking about the Sendero. That one is a different animal altogether! So Far….. The final entrant to the Road Plus range of tires from WTB is said to be the “most versatile” one by WTB. This tire looks the part, and it seems to be the case so far. The file tread is interesting and looks grippy. We’re finding it has good manners in the dirt and even in very challenging icy and snowy conditions, this tire performs above pay grade. The typical good traits of the other Road Plus tires we’ve tested shine through with the Venture as well. Stay tuned for our final, “At The Finish” post to come within a few weeks. NOTE: WTB sent over the Venture tires for test and review at no charge to RidingGravel.com. We were not paid, nor bribed for this review and we strive to give our honest thoughts and views throughout. Are these running true to their 47c size, or have they plumped up the volume after being mounted for a while? Also for reference, what’s the internal rim width? My frame has clearance for 47’s, but I recently had some 650×47 Vittoria Zero’s on 23.5 internal rims that expanded to around 51mm at 30 psi. Clearance between the stays suddenly became a real issue. @Shannon- These are staying true to size. I measured them just a moment ago at 47.6mm and they are currently mounted to the Irwin Aon GX Carbon rims which have a 24mm inner width. My experience so far with WTB Road Plus is that they do not stretch much, if at all. I think Vittoria makes cool tires. But their sizing/labelling on their website is just horrendous. They label their 650b as 40c instead of the ERTRO which is 47c! Curious how you would compare the rolling resistance of these to the 48mm 650b Panaracer Gravelking SK’s, specifically on hardback and pavement? @John- That’s a question we don’t have an answer for at this point as we have not ridden that specific tire. On Industry Nine 27mm internal width wheels, they measure out at exactly 47mm. They’re great on the varied terrain we ride, rocks, chert, sand and gravel. One interesting thing, they throw up a lot of sand, an easy way to rid yourself of the annoying wheel suckers. Perhaps we can get Grannygear to chime in on this point on the “At The Finish” post. He lives in SoCal and should be able to draw a conclusion that makes sense to you. Haven’t tried the byways, I have used the Maxxis re-fuse which is a smooth/file tread. The center “knobs” of the ventures seem to give a bit of hookup. Coming from the Schwalbe Thunder burt’s, it takes a bit of trust to roll the ventures over far enough to grab the side knobs. @Pbass…I would say that the Ventures have more grip on center, like climbing out of the saddle on a steep, dry. dirt road. I never much cared for the cornering of the ByWay. I feel that awkward transition from on-center to off-center that is not there with the Ventures. Thanks grannygear! That indeed makes me want to try them. Lots of steep and dry around these parts!